Documents presented to a judicial review this week have confirmed that the British government staged a fake ‘review’ three years ago before announcing its predetermined decision to rule out a public inquiry into the killing of Belfast defence lawyer Pat Finucane. Government memos show that former British Direct Ruler Owen Patterson “went through the motions” of examining options in an effort to avoid an inquiry, counsel for the murdered lawyer’s widow told the High Court. Mr Finucane was gunned down in front of his wife Geraldine and their three children by a British-led loyalist death squad at their north Belfast home in February 1989. Mrs Finucane is challenging British Prime Minister David Cameron’s decision in 2011 to rule out an inquiry into the shooting. 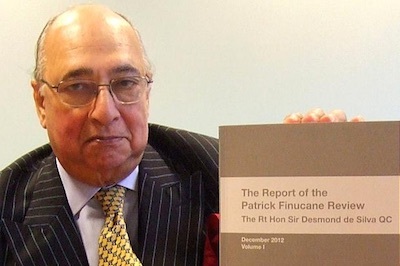 Cameron commissioned Crown barrister Desmond de Silva (pictured) to review all documents relating to the case and produce a ‘narrative’. In December 2012 de Silva’s report confirmed British agents were involved in the murder and that it should have been prevented. However, it concluded there had been “no overarching state conspiracy” and said there was no need for further inquiry. The Finucane family furiously rejected the findings as a whitewash. A four-day judicial review in Belfast this week heard that the killing was part of a British state engagement in loyalist terrorism with “murder by proxy”. The assassination featured a policy of infiltrating, manipulating and resourcing loyalist paramilitaries to carry out “extra-judicial executions”. Mr Finucane “was identified by State agents, including particular police officers and army officers as suitable for assassination, and he was shot dead at the behest of state agents in front of his family in a particularly brutal fashion,” Mr MacDonald told the court. More recently, the British government unlawfully reneged on a commitment to hold a public inquiry. Pledges to set up such a tribunal, based on the recommendation of retired Canadian judge Peter Cory, were made by a former Labour government in 2004 and reaffirmed in the following years. Counsel for the British government argued in court that issues of cost and speed had to be taken into account. Responding, Mr Macdonald insisted that the then British Direct Ruler Owen Patterson had made it clear he was against any more public inquiries “full stop”. He said that “an elaborate process of consultation” was carried out following legal advice. “He had committed himself in opposition to having no more costly, open-ended inquiries,” Mr Macdonald said. “They go through the motions.” He said the internal correspondence of government officials showed that they had “a clear result in mind”. Internal documents between the British Prime Minister and civil servants in November 2010 refer to the need to “think carefully” about “handling” the fallout with their Liberal Democrat coalition partners, Sinn Fein, the Dublin and US governments, who were all in favour of a public inquiry. Mr MacDonald referred to government papers that acknowledged the police and British army engaged in an “active and significant obstruction” of an investigation carried out by former London police deputy commissioner John Stevens. The barrister also revealed that as well as three investigations carried out by Stevens, the British government conducted its own confidential assessment of the collusion claims in 1999 - a never-published document entitled the Langdon report. The existence of the report emerged only during the legal discovery process ahead of the judicial review. Mr MacDonald said all the various investigations detailed evidence that warranted examination in a public inquiry, and that successive commitments had created a “legitimate expectation” that an inquiry would be held. He said the change of administration in May 2010, with Mr Cameron’s coalition government taking over from Labour, was soon followed by the decision to reject a public inquiry and instead commission de Silva’s sham review of the case documents. He also quoted correspondence from one of David Cameron’s closest advisors which described the murder as “far worse” than anything alleged in Iraq or Afghanistan, and that no argument existed to defend not holding a public inquiry. Those views, according to Mr Macdonald, strengthened the case for ordering a full examination of the circumstances. “An inquiry is required in this case, and the decision not to have one is indefensible both morally and legally,” he said. Mr Finucane’s son John and daughter Katherine were in court for the hearing, as was the murdered lawyer’s brother Seamus. Speaking outside court, John Finucane said the judicial review had provided an insight into the decision-making processes at Westminster regarding his father’s case. He said: “What this case this week has shown is that we have a difficulty with a hidden narrative being provided to us and the public at large.